If all goes according to plan, Capitol Hill will have its first retail marijuana shop this February. But that’s a big “if” for shop owner hopeful Samuel Burke. After failing to get the city’s approval in three Belltown locations, Burke is cautiously awaiting the city’s response to his proposed location at 15th Ave E and E Republican, currently home the the Capitol Hill Animal Clinic. According to state law, a retail marijuana shop must keep a 1,000-foot buffer from schools, parks, or community centers. Right now, things are looking good for Burke. Liquor Control Board officials initially told him that the 15th Ave E location was too close to the Parkside School daycare at 12th Ave and E Roy. But after using more precise coordinates, officials determined the daycare actually lies 80 feet outside the 1,000-ft buffer, according to documents obtained by CHS. The mayor’s office will decide by December 4th if it will submit any objections to the state liquor board ahead of the board’s final decision on whether to grant Burke his license. A spokesperson for the mayor’s office referred us to Gappert. Burke, a 67-year-old investment manager, told CHS he initially thought a Belltown location would generate the most business. “I thought the cruise ships could help underpin performance,” he said. Burke has since seen the light. CHS obtained a copy of Burke’s application for a 15th Ave location which details the months Burke spent trying to find a permissible location for his business. Earlier in the year, Burke had reached an agreement to lease the house at 1410 24th Ave for a shop, the same house that Mello Times had registered for its location. On his application Burke estimated it would cost $187,000 to open a 15th Ave E store and indicated he would not use any outside investors. Burke said he intends to lease the space now occupied by the longstanding animal clinic, but he did not submit a lease or a landlord’s letter-of-intent to lease with his liquor board application. In previous applications, Burke had obtained letters of intent from building owners. Burke said he would secure has the lease and would file it with the state once he had the city’s approval. Dr. Kris Boudreaux, who owns the animal clinic but not the building, refused to comment on the application or the future of her clinic. Ross Kling, owner of Rainbow Remedies and director of the 15th Ave Merchants Association, said surrounding businesses are ready to welcome a retail pot shop to 15th Ave. The Seattle Police Department wants those with questions or concerns about Burke’s application to contact the East Precinct Community Police Team at (206) 684-4370. Gappert said the team is primarily interested in hearing about nearby home daycares (or church teen centers) that may have flown under the city’s radar. Meanwhile Mount Calvary Christian Center’s lawsuit against Uncle Ike’s pot shop continues. An injunction hearing is slated for early December to determine if the 23rd and Union shop should be shut down while the case is argued. The city has repeatedly called for plaintiffs to provide a more “definite statement” regarding its complaint that Ike’s is violating I-502’s 1,000-foot buffer rule. This entry was posted in News, etc. and tagged 15th Ave, hilltop, marijuana by Bryan Cohen. Bookmark the permalink. “Burke told CHS that he would secure the lease once he had the city’s approval.” I don’t think that that’s the normal way of doing this. Other people as far as I know have had to have the location secured at the time they applied. Something is very “off” about all this. I think I’ll take this entire story with a generous helping of Himalayan Sea Salt for the time being. Also, is the contact phone number he gave still disconnected?Just sounds shady to me. I like the idea of a pot shop in the neighborhood, but not one that displaces a business that has been there for decades. I would like to hear the details regarding Capitol Hill Animal Clinic’s situation. I hope they aren’t being forced out by a greedy landlord. I’m glad somebody used precise measurements for determining the 1000′ buffer. A handful of us talked on a different thread about the criteria for determining the 1000′ buffer and I’m glad to know that no matter how you slice it, the school is outside the buffer. Barely outside is still outside. I still wonder what’s up with the Vet clinic too, but if the owner won’t tell us, we’ll never know..
As of two days ago, CHAC had not been notified by the landlord that anything was going on. They also said that the building owner knew nothing about the proposed pot retail. (I didn’t ask permission to quote anyone, so I’m not) Kris isn’t commenting, imho, because there is nothing useful that she can say. This is very stressful for the folks at CHAC, understandably so. I reiterate, there’s something shady/shifty going on here, I just don’t know what it is. I’m skeptical about the new location (probably because the idea sounds so great). 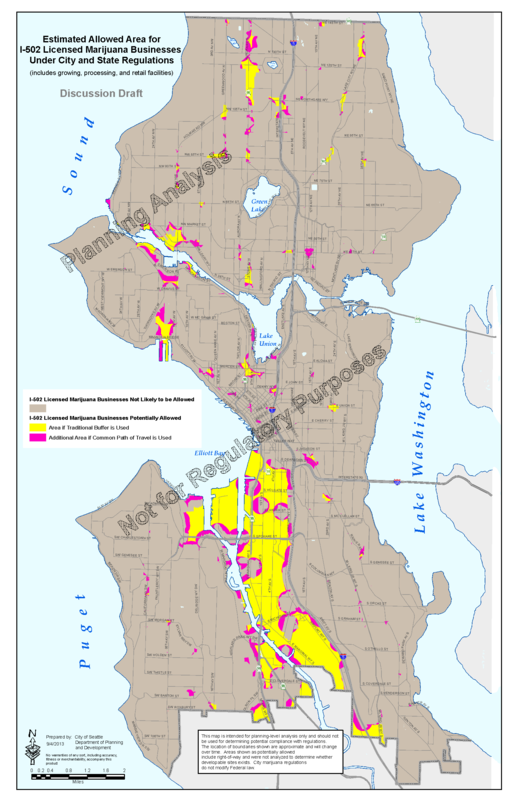 Seattle DPD put out a map over a year ago and their analysis indicated that 15th would only qualify for marijuana retail under the 1000 foot common path of travel; not the 1000 foot traditional buffer that was eventually settled on (map linked below). Can someone please clarify why the DPD map is in error and how it is that 15th might now qualify? Cripes, this bureaucracy. Yes, we should be patient, and yes, we shouldn’t antagonize the Feds. But honestly, Colorado is making us look like a clown car. I’ll be curious to see how Oregon and Alaska handle this industry. If they’re smart, they’ll learn from our complete clusterf*ck. I want to clear up two misunderstandings in the article that would have been avoided had I been more articulate in my discussion with Bryan. The lease has been secured but it is not necessary, nor asked for, by the city during the period in which it makes its determination. The prior lease information that Bryan was refering to is information provided to the Washington State Liquor Control Board as part of their approval process. These are two very distinct governmental agencies which do not require the same information to make their determinations. As to my phone number being disconnected, that came as quite a surprise to me. I think that it is probably explained best as a misdial. Bryan called that same number yesterday when we spoke and its the same number the WSLCB and city of Seattle has always used to reach me. Sorry for the confusion. Thanks for clearing up, Sam. Updated above. Just because CHAC isn’t commenting doesn’t mean they don’t know something. Just because they may move doesn’t mean they’re being forced out. Maybe they get a big wad-‘o-cash to move if they let somebody buy out their lease. Maybe they were planning to move anyway? You basically don’t know anything for sure so it’s silly to keep inferring the worst and most nefarious of all outcomes. When my mother in law was in town recently, she told me that this vet clinic used to be a cat-only vet back in the 80s. Please please let it be named catnip. It will be interesting to see how this plays out. I live right around the corner and don’t really mind the potential pot shop, though I don’t smoke. I just hope it doesn’t make parking too much worse than it already is (I think the vet has a few spaces out back?) and they aren’t lax with enforcing the public smoking ban since the smell tends to carry. Oh look, somebody left the bin unlocked again. Tourette’s on the loose again.